I'm not sure what it is about old unfinished projects, but they seem to grow in magnitude as time goes by. They sit and lurk in the back of our minds, their presence a shadow that can be ignored or forgotten until stumbled across again. Since autumn, my sewing area has been migrating from it's designated location in our office/sewing space to the formal dining table downstairs. We have am enormous table that is perfect for quilting large quilts, and still having a cutting area on half of it. At first I needed the table to help a friend learn to quilt, then to quilt a large quilt and then to work on a couple large projects that took longer then expected. The dining room was great, but my sewing was taking over the downstairs area. Stacks of fabric began popping up, bins of scraps, and then there was the thread. Somehow, thread falling on a hard floor is worse than thread falling on carpet, and it had reached epidemic proportions. In the meantime, sewing room had grown into a dumping ground for fabric, and notions and scraps, and of course, paper. Somehow, the contents of my cupboards were evacuating themselves onto the floor. Thank goodness for doors, right? Wrong. I finally snapped. For me, the biggest hindrance to creativity is clutter, and not being able to see your workspace. Everything unnecessary has been purged, and everything useful and needed has been sorted, and organized and put away (mostly - this part is still in progress). While doing this, I stumbled across a memory. I found these really, really old projects, still unfinished. Around 11 years ago, my Grandmother, and Mom and siblings attended a local craft fair. I was newly married at the time and was just finding my crafty feet after a few years of non-craftiness. My Grandma and I were intruiged by a type of craft where you either knit or crochet with beads that have been woven onto a strong rayon thread/floss. She started the pale blue crochet project above, and I dove right into making a knitted black clutch, as well as a crocheted black scarf. Within the next year, my Grandma was diagnosed with pancreatic cancer, and passed away six months later. Her scarf was unfinished. It still needed to be blocked and fringed and ends woven in. The family gave it to me to complete, and I tucked it away in a pretty box in my sewing cupboard. Ten years, three kids and 4 homes later, I found it again. I'm pretty sure it's reappeared over that time, only to be guiltily tucked away again, for someday. I'd had enough. Within minutes the ends were woven in, and it was soaking in a bowl, ready to be blocked. As soon as it was blocked, my scarf was blocked as well. By that evening, I was making fringe. (For some mysterious reason, I thought that this would be WAY harder than it actually was.) Within an hour, my Grandma's scarf was done. Too often, we let the things that are not present in our day to day life be forgotten. Like old projects, memories too need to be pulled out, and dusted off, and loved. As for the other two projects in the top picture, I still haven't decided if I'm going to add a fringe to my scarf or leave it be, and I'm looking for a clasp for the clutch. Still, they are well on their way to being finished. Linking up my finish with finish it up Friday. Over the winter break, I stumbled across the Missouri Star Quilt Company's tutorial of the Double Slice Layer Cake Quilt. It inspired me to cut into my little 10 inch charm pack of Shelbourne Falls, by Denyse Schmidt. It's was waiting for the perfect type of pattern, one that used every bit of the fabric, without an inch of waste. I love this line of fabric, particularly the blues and reds that mingle with the creams and the blues and purples. There is something very vintage-like about it. I dug through my scraps and pulled out a bunch of prints that would mix well together, cut them to 10" and went to work making a throw sized quilt. These blocks are very easy to chain piece and came together super quickly. I didn't follow the tutorial exactly when it came to block placement, and just let them sit where they seemed to suit best, creating a really scrappy, and somewhat random look that I love. Linking up with Amanda for finish it up Friday. The finish I'm blogging about this week was actually made a few weeks ago, but I hadn't had the chance to get decent pictures. That being said, for some reason, I still cannot seem to get a decent whole shot of it. I think I need better lighting, or perhaps, some actual sunlight? The pattern is one of Camille Roskelley of Simplify's mini patterns. This one is the mini Swoon. I love it. This mini quilt measures about 19" square. The finished block size is about 8.5 inches, and the smallest piecing cut was 1.5 inches. I may also have a bit of an issue with regular sized HST's (half-square triangles). I've learned that micro-sized ones seem to amplify any imperfections and drastically affect block sizes. AND, for some reason, my machine kept wanting to eat up my tiny little blocks. It could be because they were tiny little blocks. In retrospect, I should have changed the plate on the machine so that only the needle could fit in (as opposed to the plate with a wider opening for a zig zag stitch). Perhaps it would have eased things a bit. I may make this again, in the near future, perhaps a bit more accurately. This is a really quick finish for a little project, and it's just so darling. I'm really loving minis at the moment, but perhaps I need to finish my big Swoon quilt before I venture any further down the path of starting new projects. 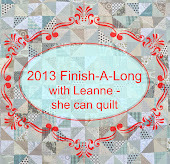 Linking up with Amanda at Crazy Mom Quilts, for Finish It Up Friday. The last few weeks have been ridiculously busy on the crafting front (a good, happy, mildly crazy, kind of busy). I am currently taking maternity leave. And, I'm dreading my return to work later this year. I have loved every single second I've been able to spend with my little one, and the time I've had with my bigger ones. It's been so precious. When I return to work, not only will I not be able to spend as much time with my babies, but I'm pretty sure my crafting time will be massively curtailed. We'll have to see. Maybe I will forgo sleep entirely? With this impending return, I've been working like mad on some ongoing projects as well as trying to complete my outstanding WIPs. The project I'm showing today has been on my list for a good 4.5 years or so (I don't know exactly when I started it, but it was a LONG time ago.) It is a jelly roll and charm pack friendly quilt. I saw it at a quilting show, and HAD to buy the fabric, called Cotton Blossoms, from Moda. Little did I know at the time, but it was the first line of fabrics from of one of my current absolute favorite fabric duos, Bonnie and Camille. The pattern is called Once Around The Block. I wish I had known before starting it that it is not chain piecing friendly. It's a sew on a piece, trim, press the seam to one side and repeat kind of pattern. It's slow moving. I moved this project downstairs to my makeshift studio/dining room (still temporary), and readied it for piecing. Every now and then, I'll walk by, and make a block or two, or seven. If I need a break on my current deadline project, I'll make a block. This method seems to work for me and now I'm well on my way to finishing the blocks. I keep vacillating on whether I should change the pattern to something more current and use the blocks in a different kind of way, but I haven't decided yet. We'll see. In the meantime, this is my new favorite method for working on a WIP, keeping it right out front and easy to work on alongside everything else. Linking up to Kelly at My Quilt Infatuation for Needle and Thread Thursday. This quarter has proved to be a very productive one. I have a few projects and ideas in the wings that will be coming out soon, but first, I want to share my three finishes. Of course, I didn't even come close to completing all my projects, but I did make quite a bit of headway on the ones not listed here, even though they aren't finished yet. My original list can be found here. 1. The first item that was finished was my son's "Pop Blanket" from Tin Can Knits. There wasn't a lot to be done to finish it up but there was a sort of roadblock in the weaving ends in department. I pushed through and it was done back in October. 3. My last finish, my "starstruck" quilt, is one that means an awful lot to me. I've spent literally dozens of hours on this quilt. It is my very first quilt that I've kept just for myself. I blogged about it here. This has left quite a lot of projects, still in progress, but I'm definitely making headway. It's a new year, and I'm discovering new ways to keep things focused and accessible and easy to work on. So far, so good.